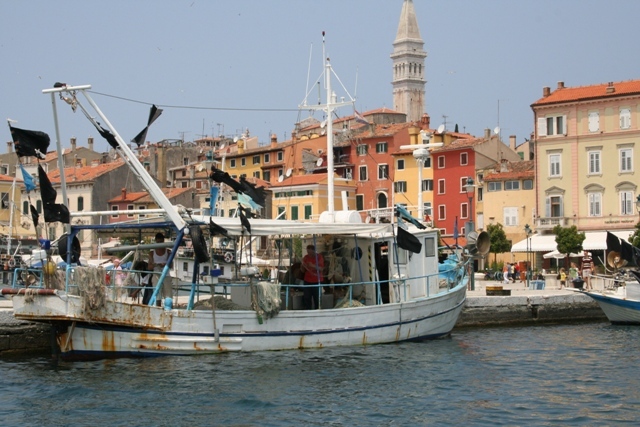 To fully experience Rovinj you have to go on the water. 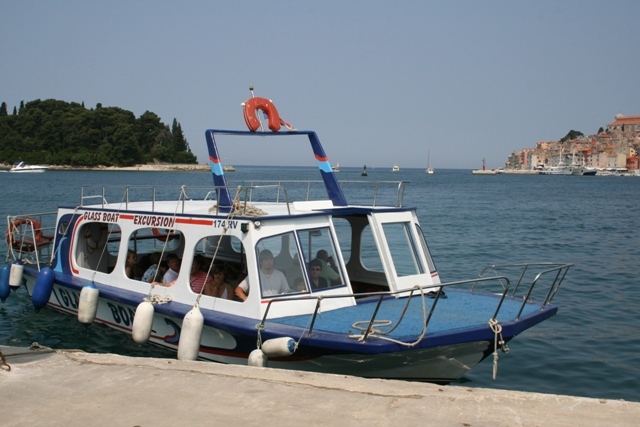 There are boat trips aplenty, just which to choose was our question. In the end practicality ruled. 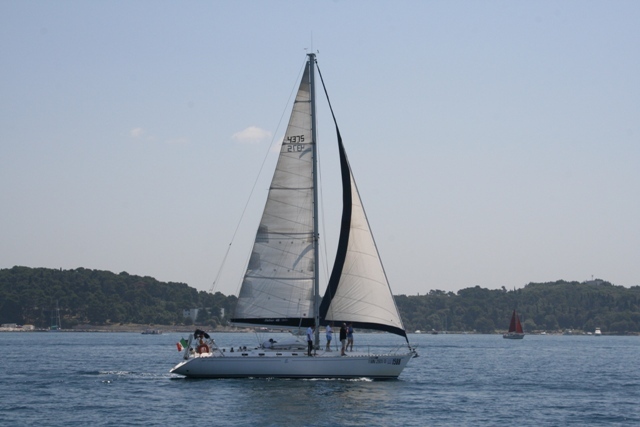 All day on the water exploring the azure rocky coastline and islands sounded enticing…. however back to reality – with a lively 3 year old we figured shorter would be better. Our first nautical foray was on a glass bottomed boat. It lasted around an hour and there was no need to book in advance. We just showed up 15 minutes before the departure time and climbed aboard. The boat was small with a glass viewing area on the bottom. They squeezed on a lot of people so you got cozy with your neighbour. It was fun to look through the glass – lots of little fish and rocks. When it’s dark they have a light under the boat so you can see the night creatures. 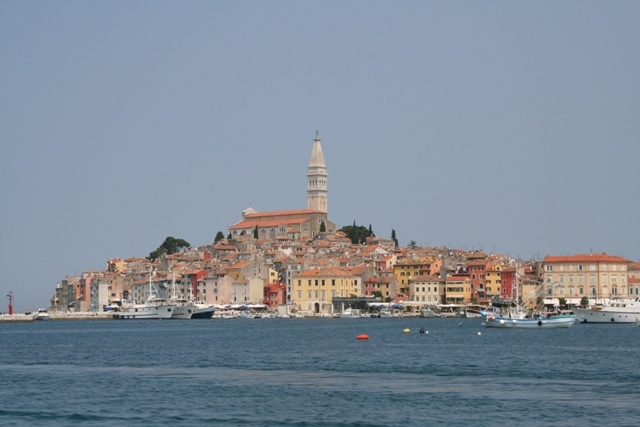 The initial novelty wore off fairly quickly and we preferred to enjoy the views of Rovinj and the islands. 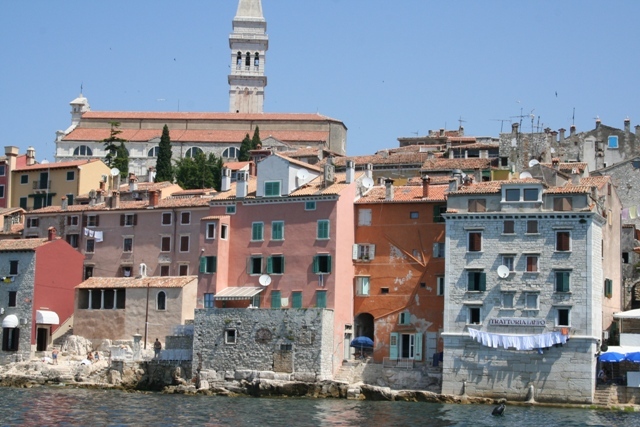 It is just spectacular – Manhattan has its skyline, so does Rovinj. That 60 foot church tower can be seen from the sea for miles around. 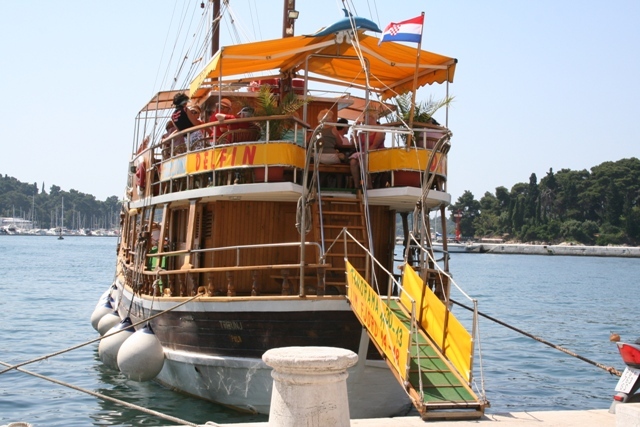 Another day, another boat trip – a bigger vessel this time named Delfin. It had three decks with a small sundeck on the top where you could sunbathe (for an extra charge). We preferred to lurk around the bar area – drinks and snacks were offered. One and a half hours of sailing this time with a short and very interesting commentary on the sights in Croatian, Russian, English and German. Son made some new German friends so he was happy. 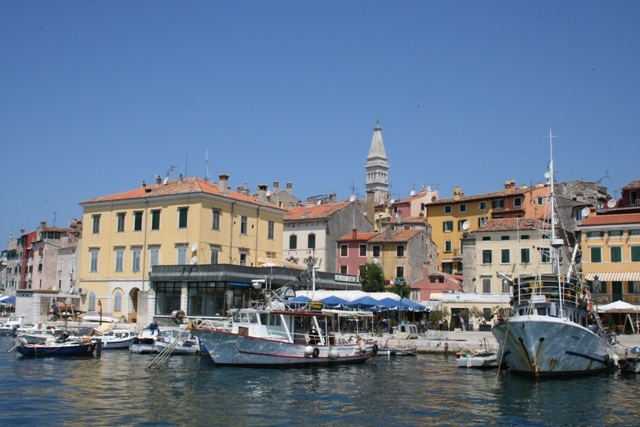 We lounged on the comfortable padded benches around the edge and feasted our eyes on Rovinj. The sea sparkled, the sun shone high and the scenery was awesome. What more could you ask for? No need to book is definitely an advantage with a three year old. And shorter is the go for us as well, unless it’s a very child-friendly itinerary with lots of stops and/or activities/variety. Drinks and snacks are a help, too! Yes – long boat trips and (our) child don’t mix!! 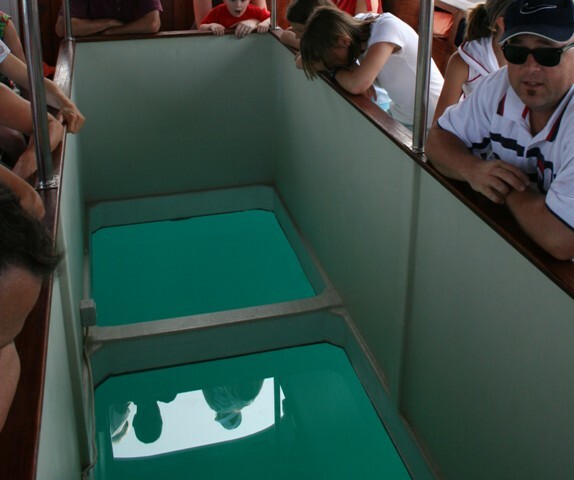 I went on a ride in a glass-bottomed boat once when I was a kid and loved it! It’s different and a lot of fun! Thank you for reading! It is a gorgeous little town – well worth a trip there, we loved it. It’s beautiful! …and so lovely that you are bringing up a tiny traveller also. Yes, he has notched up a lot of air miles and countries already! No problem…. 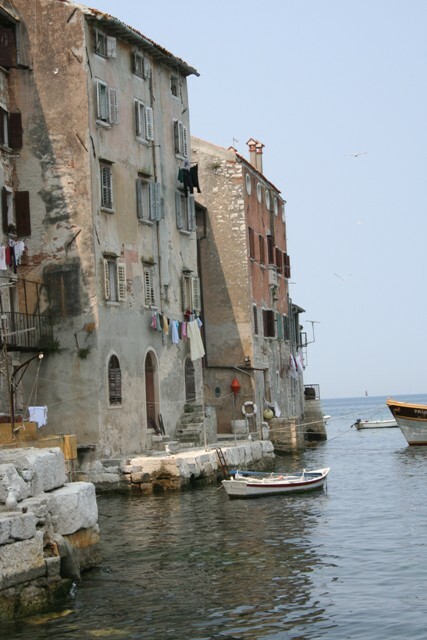 we loved Rovinj too – what a stunningly gorgeous place!